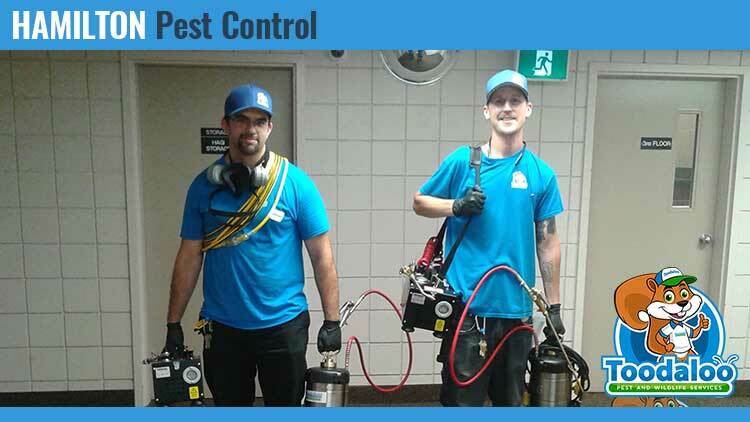 Hamilton Pest Control - Full Service Exterminators - Call Us Now! Common pests are a dime a dozen in the Hamilton area. The more infestations that pop up around local communities, including stoney creek and surrounding areas, the more demand that there is for integrated pest management practices. It can be difficult to narrow down just which service is going to work for you, picking one has never been easier than with Toodaloo. Our pest control Hamilton services can treat infestations from even the tiniest of insects to the most common rodents. Prompt, professional service (and a pest-free property) is only a phone call away! While DIY options for insect or rodent control, are widely available, only professional pest control companies can get the results that you need. Identifying major pest problems is able to be done at home but treatment is another story all together. With each type of pest that makes its way inside your property, there are certain obstacles that come along with treating them. Some of these hurdles might be heights, or underground burrows; others include the possibility of bites, stings or continued contamination. Over years in the pest extermination industry, our Toodaloo technicians have developed treatments for wildlife infestations of any size or style. With the right safety equipment and training in play, our pest experts can tackle a variety of insects and rodents from both residential and commercial properties. The biggest tool in our arsenal is knowledge and training but imaging tools, injection rods, and safety equipment all play their part as well. The best way to get the best results for your pest problem is to call in reinforcements at the first sign of insects or rodents. Rats and mice breed quickly and will use your property as a buffet, hotel, scratching post and bathroom. While rodents might be the obvious culprits for damage, silverfish and carpenter ants are right behind them. Both tracking and treating unseen insects and vermin are vital to the smooth running of your property. These services include proper rodent control and termite control. Structural damage is not all that you have to worry about either! Contamination is a real problem and pests are experts at it. Ants, roaches and even pigeons are quick to be spread around properties. Finally, health hazards are a real problem with infestations as well. Biting insects include bed bugs, fleas and wasps. These insects are all quick to make a meal or a pincushion out of their human hosts. For all these reasons and more, it is important to act quickly for your pest control services in Hamilton. Simply spotting a spider or silverfish does not mean that property owners or managers are able to get rid of them. Without the proper tools for the job, pest control is like shooting snakes in a barrel. With a professional and affordable pest control company like Toodaloo, you have access to all of the top of the line tools and equipment to get the job done right. Imaging tools and injection rods are used to spot pests and bring the fight directly to them. In addition to hands-on service, our Toodaloo technicians have plenty of partners that extend our range. Pest removal is its most effective if infestations are caught early. It can tough to spot a small pest here or there, but by picking up on the small queues that come with pests, you can limit the amount of damage to your space. It is highly recommended that property owners grab the phone at the first sign of webs, droppings or nests. Calling Toodaloo does not only provide expert results for your Hamilton pest control solutions, but gives peace of mind and excellent customer service. Quick fixes and temporary measures do no do much to maintain a pest-free environment all year long. When you are ready for long-term results, call Toodaloo today! All of Toodaloo’s pest control methods, for homes and business, are all environmentally friendly.